Ahhhh winter, you are officially here and boy is it getting chilly AF! For some reason though this winter, I am totally embracing the change and loving it. I’m ready for some time to turn inward, slow down, nourish the bod and run up on the couch with some seriously delicious wintery meals. 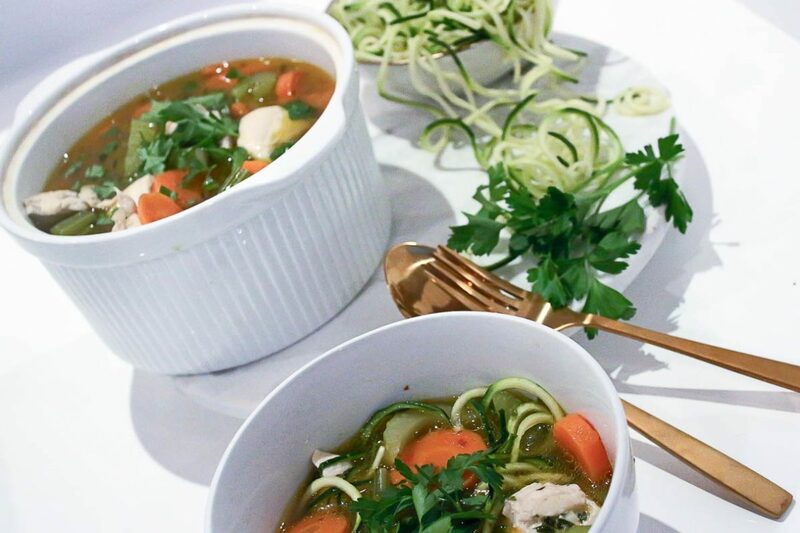 You know when you would get sick and your mum would make you some yummy chicken noodle soup to have on the couch and it would instantly make you feel so much better…. Well my gorgeous friends I have created the ULTIMATE healing chicken zoodle soup!!! Sorry mum, yours was great but this is next level. I’ve used zoodles not only because I’m Zucchini obsessed and love to sneak extra veggies in but it also gives you a great low-carb option- without making you feel deprived. Oh, and did I mention for all my food intolerant babes, this gorgeous creation is Low FODMAP, Gluten Free, Lactose Free – ahhhhh- MAZING! Share The Wholesome Hearts Vibe! Season Chicken with Salt & Pepper. Use the garlic Oil to cook the chicken, until golden brown and almost cooked. Approx. 2-3 minutes. Then set aside. Heat Oil in soup pot over medium heat. Add celery, carrot, and salt, sauté until golden brown. Pour 1 cup of stock/bone broth, cook until it has reduced to half. Add remaining stock, bring to boil. Reduce heat and simmer for 10mins. Stir in chicken and zoodles, cook for further 2 mins. Can be stored in airtight container for 5 days in fridge or longer in freezer. Subsribe to The Wholesome Heart!